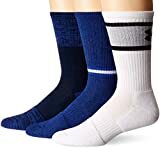 Ready for action wherever your day takes you, these Under Armour Phenom Twist Crew Socks for Men deliver great support and breathability. 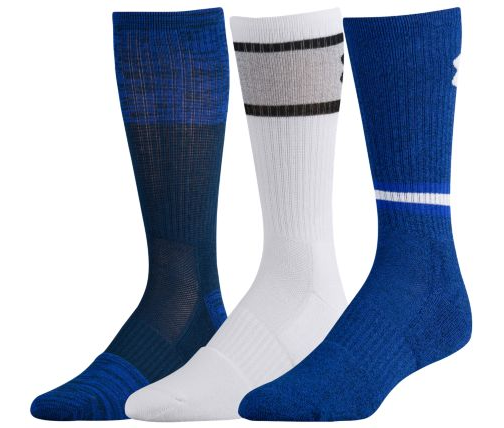 Made with HeatGear poly/cotton blend featuring ArmourDry moisture-wicking technology, these performance crew socks pull sweat away from your skin and accelerate evaporation. Ventilation Channels boosts breathability further to keep your feet dry and comfortable. Strategic Cushioning provides flexibility and breathability with less bulk around your foot, while Dynamic Arch Support provides lift under your arch to resist and reduce foot fatigue.